Wall Street expected more from Google, and in a rare turn, Google didn't meet those expectations. Wall Street was expecting Google to post Q2 2013 earnings of $10.80 per share on net revenue of $11.4 billion, but Google came in low with earnings of $9.56 per share on net revenue of $11.1 billion in the second quarter. Investors weren't too worried about the numbers though, and Google stock fell just 1% to about $910 per share in after-hours trading. This may have been because consolidated revenue was up 19% year-over-year for Google at $14.11 billion. 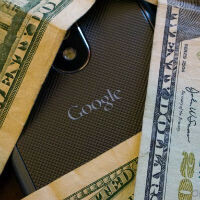 Of that number, $13.11 billion was from Google products and services and $998 million from Motorola. That is a bit of a dip in Motorola revenue from the past couple quarters, but considering Motorola hasn't released any new products, that was to be expected. Motorola also saw a pretty big drop in its staff this quarter, which could be helping its overall profitability. As of March 31st, Motorola employed 15,152 people, but that number was down sharply by June 30th, at which point there were only 4,599 employees left. Wait for the next 2 quarters, Motorola X, Nexus 5 G2, new Nexus 7, probably 10, Google Editions, Google Glass, expanding mobile market, tablet market, Chromebook market, HW sell, music services in more countries, Waze data to Navigation and... Key Lime Pie! Damn, 10k people at Motorola were axed? That's more than restructuring. That's bulldozing and rebuilding! Well, they are not selling phones as much, and Google did give them great severance packages. But, it is sad that Moto is almost gone. Blackberry is on the way out, and I just hope that HTC can make it. 5,170 of them are Motorola Home employees, which was sold-off by Google earlier this year.